Our products MBuster and MCBuster are specialized in analysis of optical communication in cars. Both products are developed on a FPGA-based analysis-core. Together with it's accompanying software they are perfectly suited for both development and aftermarket when you want to analyze the bus traffic. The devices are handy, easy to carry in different environments for the technician. Both products come together with a software package including drivers and a powerful application for analyzing data. Included are also an advanced trigger functionality for use together with external measurement equipment. The analysis-core supports the different optical framrates that are used on the market. the devices works between 9 and 16 V DC. On customer demand we are able to deliver a software package compatible with common database and logfile formats on the market. MBuster is able to communicate with the host through both USB and RS232. 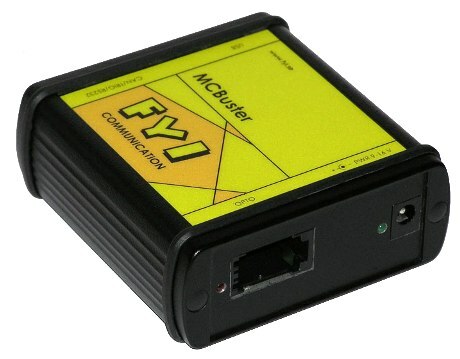 MCBuster is able to communicate with the host through USB, RS232 and CAN (ISO 11898). The major difference compared to it's cousin MBuster, is that it is able to deliver the messages from the optical bus segmented into CAN-frames. Click here to download MCBuster Datasheet. To use MBuster or MCBuster online connected to a PC via USB or RS232 you need a driver. You also need the analysis application MBusterViewer. MCBuster is also able to connect through a CAN channel. In that usecase a database can be used for interpretation of the CAN-frames received from the unit. Below you will find the latest versions of the necessary files. Click here to download MCBuster USB driver v2.02.05. The driver is used for both MBuster and MCBuster hardware. The viewer is used for both MBuster and MCBuster hardware. Click here to download CAN signaldatabase v008E. The database is used for MCBuster hardware.